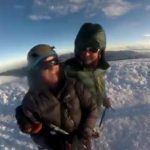 On Wednesday, Edita and I reached the 6310m summit of Chimborazo for the second time. We climbed via the Whymper Route on the southwest ridge, which traverses across the west face to join the Normal Route that we climbed last time. We reached the summit at 6.30am with Romel, the same guide who led us up last time, and had it to ourselves. Conditions were better than our previous ascent. 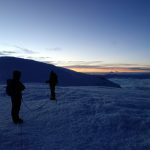 There was more snow on the glacier, and the traverse between the two summits was flat, without the maze of penitentes that confronted us last time. Our ascent was more significant in another way. We started our journey at Guayaquil on the coast. Following Edward Whymper’s route in 1880, we cycled to Babahoyo and up through the mountains via Guaranda. 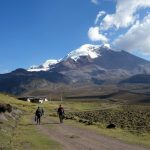 Upon reaching the park gate on the west side of Chimborazo, we circumnavigated the mountain anticlockwise, taking our bikes via Riobamba to Urbina on the east side, then trekking around the north side and returning to the Carrel Hut on the west, from where we made our ascent of Chimborazo. On the way we completed an ascent of Chimborazo’s little sister, 5020m Carihuairazo. I cheated slightly by taking the support vehicle for a short section from the Chimborazo park gate (4200m) down to Riobamba (2800m) after suffering from some bad food poisoning in Guaranda, but Edita completed this whole journey by human power. We believe this may be the first time ever that Chimborazo has been climbed from sea level in a single journey, but it’s impossible for us to know for sure. 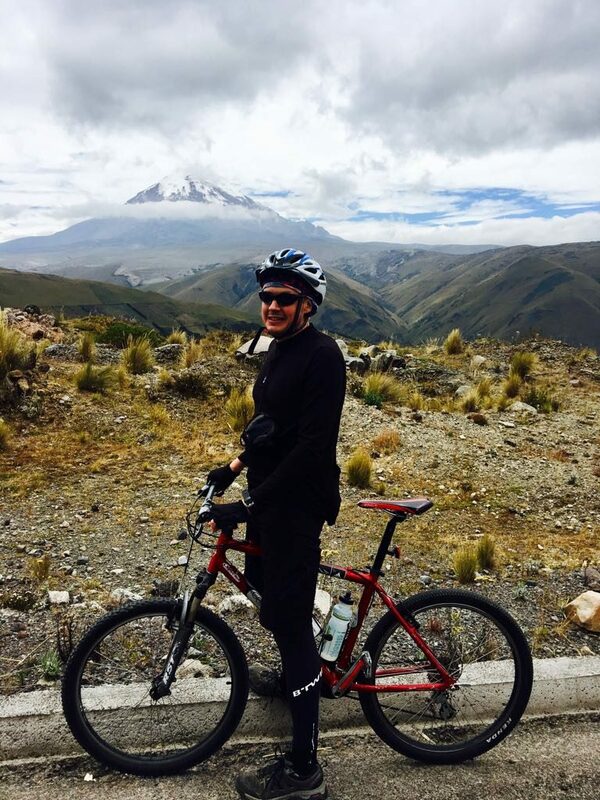 Our support driver for the bike ride was Pablo Montalvo, who completed an ascent of Cotopaxi from sea to summit in five days, another possible world first, although he also doesn’t know for sure. In Urbina we spoke to the cousin of the Swiss-Ecuadorian speed climber Karl Egloff, a keen cyclist and another possible candidate, but we understand he has not yet achieved this feat. Me on the road up to Chimborazo. I was still suffering from food poisoning this day, and although I made it to the foot of the mountain I had to take a support vehicle on the way down while Edita continued to Riobamba alone. When we return to London I will begin writing a book about our adventure. 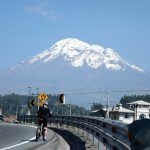 I would be interested in hearing from anyone who may have completed a previous ascent of Chimborazo from sea to summit (or any similar feat), either by bike or foot, so that I can include their story. The important thing for me is not to claim a record (after all, it would be Edita who has the record, not me), but to tell a good story as completely as I can. 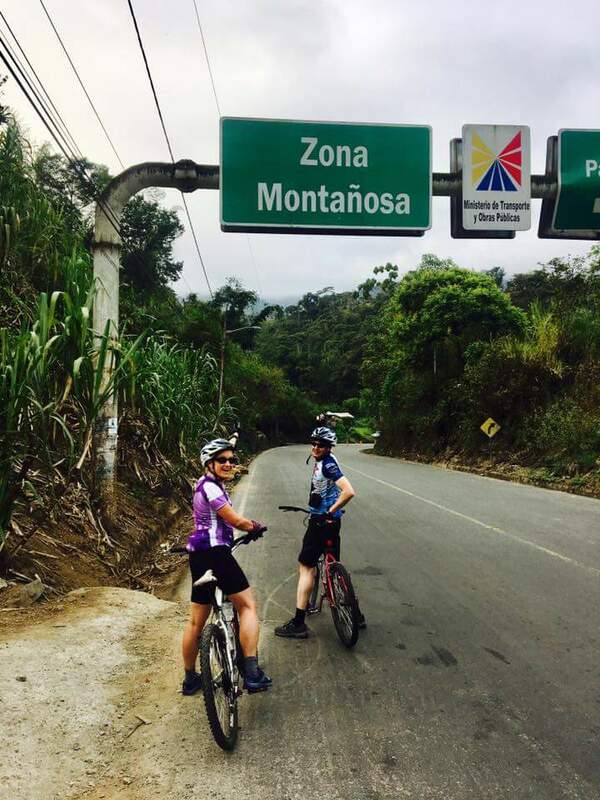 If you know of any keen cyclists and climbers who have travelled extensively in Ecuador, I would be grateful if you could send them this blog post, and ask them to get in touch, to help us discover if this is a world first and to include any similar adventures in this story. Please also share this post on social media to ensure a wider distribution. Well done! Congrats on this great achievement! And a toast from afar! Nice experience Mark. I biked and climbed quite a lot in Ecuador in the 1990s and early 2000s, but I’m unaware of anyone doing a sea-to-summit. I never quite pulled it off on Chimbo. I first set up my mountain bike I’d purchased in Quito used there. Had to invent a lot of things. Like when everyone told me “No es posible” to putting a pair of low-rider front racks onto a suspension front fork. I said “watch me” and invented all the brackets and hardware. Still use that bike from time to time. My focus was a bit different, though. Just wanted to load up ultralight camping and climbing gear on the bike and take off for a week or two at a time and poke around and have fun and see what I could do. Had plenty of “adventure” riding, life experiences, and even got a little climbing done. Sometimes life is the most wonderful when you create the right conditions and then go with it! 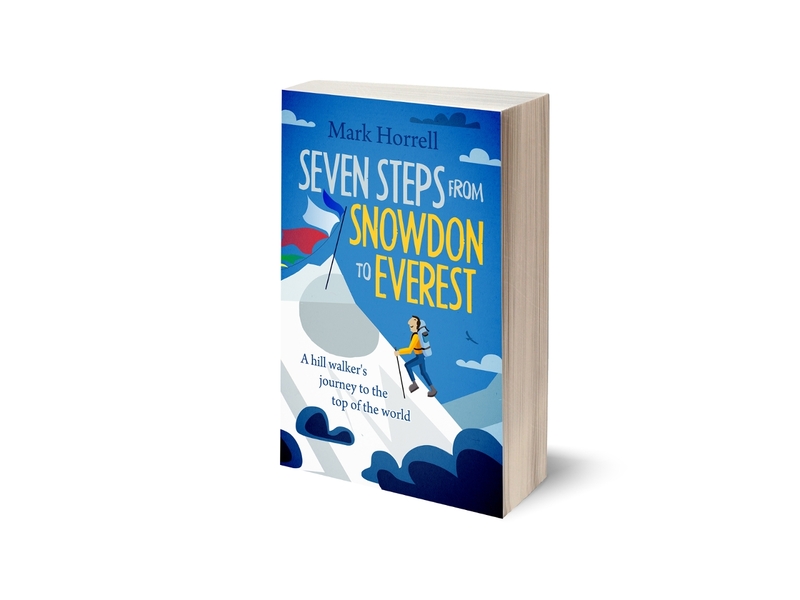 My many years of traveling and guiding all over the world have often shown me, personally, that the most memorable things are often those that just happen, and I’m quick enough to simply go along rather than to try and stick with some preconceived plan.